This image was taken at a feeding station at the Sepilok Orangutan Rehabilitation Centre near Sandakan in Sabah in May, 1999. The centre was established in the mid 1960's with the aim of rehabilitating orphaned or rescued orangutans and returning them to the forest. The feeding stations are set up to provide bananas and milk to those orangutans who have not, as yet, become fully independent. The centre also aims to educate visitors regards the plight of this endangered species and has become a tourist attraction in the process. The actual number of orangutans still surviving in the wild is not clear, but believed to be about 7000 in Sumatra and probably 50,000 to 60,000 on Borneo. Their range once included much of south east Asia from India to southern China, through much of the Indonesian archipelago into Borneo. The threats to their survival are numerous with loss of habitat due to both legal and illegal logging, forest clearing for agriculture, notably for the development of vast palm oil plantations, and the illegal trade in animals and animal products. Part of that trade includes the capturing, shipping and then sale of baby orangutans as pets in places such as Bangkok and Taiwan. The capture of a baby usually involves killing the mother first. As if that's not disturbing enough, it's worth pointing out that for every captured baby orangutan that gets to "market" another two or three die en route. The image was captured using a Pentax MEF 35 mm film camera with a 80-400 mm zoom lens fitted. The film used was Fujicolor Press ISO 800 colour negative, shutter speed and aperture were not recorded but resulted in an unintentionally underexposed image. The negative was scanned with an Epson V700 flatbed scanner using Epson's own "Epsonscan" software, curves adjustment was employed during scanning to extract what little shadow detail was available. 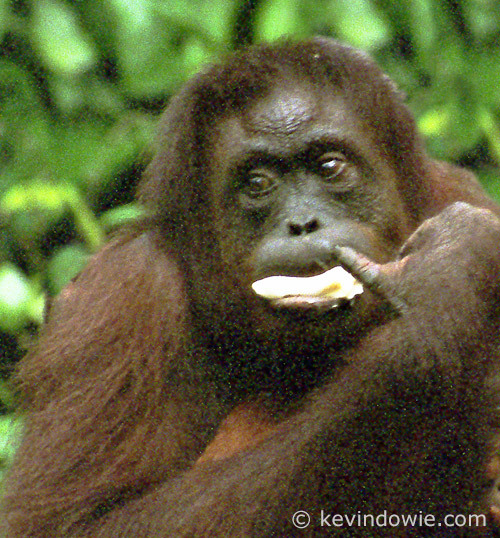 The image is a close crop of the original 35mm frame so as to exclude distracting elements and focus attention on the face, and in particular the eyes of the orangutan. In the original negative, a person was partly visible at the edge of the frame and has been removed in Photoshop.